The name Edsel was derived from the father of Henry Ford II. 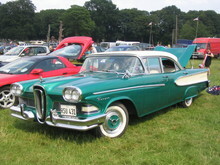 The inexpensive Edsel Rangers and Pacers were to be slightly more expensive than the dearest Ford while the Edsel Corsair and Citation could be slightly more expensive than the Mercury. Ford's promotional campaign was tremendous. For two years long, the trade press continually wrote about the subject. Finally the cars were launched on 4 September 1957. "Three million curious people have looked at the long awaited car," Ford wrote in its press releases. But they did not buy the cars. Dealers who had ordered too many Edsels had financial problems. The cars were eventually sold but at a loss. 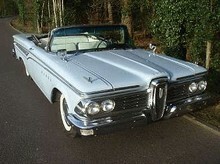 Ford decided on 19 November 1959 to pull the plug on Edsel, although a few thousand were built from existing parts. Ford had lost $300 million in the space of a few years, equivalent to billions today.